Indulge your skin with this luxurious, nourishing body wash combining precious Moroccan Argan oil with soothing Aloe Vera. The blend of beautifully rich oils and exquisite Rose Otto scent is ideal to gently cleanse, comfort and renew your skin. Precious moroccan argan oil with soothing rose otto oil. Cleanses and calms skin.Enrich your skin and senses with this soothing Moroccan Rose Bathing Collection infused with a unique Argan+ Synergy, rich in nutrients and vitamins. Indulge your skin with this luxurious, nourishing body wash combining precious Moroccan Argan oil with soothing Aloe Vera. 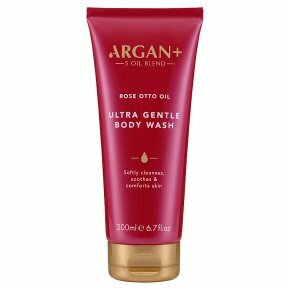 The blend of beautifully rich oils and exquisite Rose Otto scent is ideal to gently cleanse, comfort and renew your skin. Argan + Synergy is an all-natural 100% blend of precious Moroccan Argan Oil with 4 other amazing oils: Baobab, Kukui, Moringa and Sacha Inci, all selected for their restorative, regenerating and nourishing properties. Directions for use: In the shower, squeeze the body wash into hands and lather up across damp skin before rinsing thoroughly. For even softer, smoother skin apply with a loofah.